Located within the Croom Tract of the Withlacoochee State Forest, the Hog Island Recreation Area lies along the east bank of the Withlacoochee River southeast of Nobleton. The area is named after a nearby uninhabited island formed by two branches of the Withlacoochee River that diverge and then meet again - and is accessible only by boat. The recreation area includes a campground, river access, and hiking trails. The main feature of Hog Island Recreation Area is the large campground. Tent and RV camping is available here all year long. Restroom and shower facilities are available. Dogs are not allowed in the campground. A large youth group campground is also available by reservation. Located about 6 miles north (downstream) from Silver Lake, Hog Island provides access to the Withlacoochee River with a concrete boat ramp. Although suitable for boats on trailers, the river is so shallow here most of the time that only small motorboats or non-motorized craft should be launched. This is a very popular spot for kayaks and canoes, as the river is navigatible for miles in both directions except at times of severe drought. A 1.6 mile loop nature trail begins near the entrance to the campground area. Look for the trail kiosk along the east side of the entrance road. Benches are provided at various spots along the trail, making for an easy one hour stroll with the family. 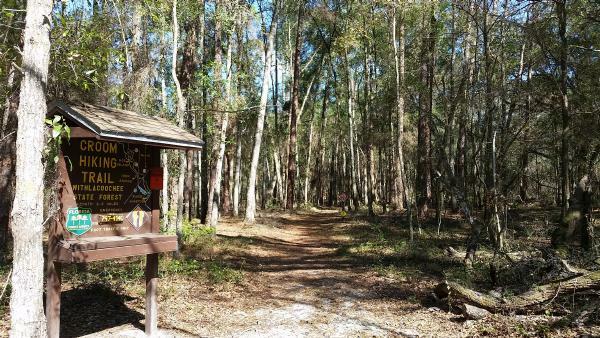 For more ambitious hikers, the Hog Island nature trail also connects with the Florida National Scenic Trail.